But it seems some doggie journalists think all this positive stuff is just a fad! Forget science, ethics etc... look at how gorgeous and famous Cesar Milan is.... ooohhh dominate us little women in our fine and fancy clothes.. simper simper... 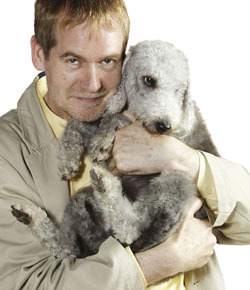 I understand the Barking Blonde's stuff is meant to be just an act, but I much prefer Ashleigh and Pudsey. However, I would pay good money to see Cesar Milan put the Barking Blondes in an Alpha roll, but I suspect they'd adore it too - especially if it was on camera and the lighting was quite favourable. There's a balance in dog training. While at the dog show at the weekend I heard the trainers in the demo ring telling people even if their dog took 10 minutes to come back they should *always* give it a treat when it came back and give lots of praise. I want to know, what reason has the dog got to come back instantly when it can get everything it wants after 10 minutes! When you're training a dog, there should be no way it can take 10 mins to return - that's bad training. Once trained, if a dog takes 10 minutes to come back after a recall I'd be really happy to let it watch me feeding a different dog! Beverley I have trained dogs for over 20 years and I have never seen a better behavioural trainer than Cesar Millan. You are wrong to mention his name when you say "Yell and beat" and this shows a lack of any working knowledge of dealing with aggressive dogs. If you watched all of the shows you would know that calm is his keyword and he doesn't advocate beating dogs. I have seen videos on Youtube, some which have then been removed shortly after the publicity they receive, of the so called great CM kicking dog's - several on one the videos, and choking the dogs into submission. Not only is the use of choke chains cruel and unecessary, but they can also cause front leg paralysis, and damage to the throat and vertabrae in the neck, and of course in extreme cases, death! Having seen quite a few programmes featuring CM's brand of training, I have seen dogs shutting down because of fear. Why when reward/positive training can work positively towards changing even the most fearfully agressive dog(yes most aggression is fear related, so why use force to try to remedy it). I speak as someone that has been involed in training dogs for both pet and competition and have worked top level competition for over 25 years, using these reward based techniques. How anybody can defend the treatment meted out towards dogs that CM uses I don't know.